A winter wonderland where it seems as if even white breath will turn into snow. The cold air is more crystalline than usual, accentuating the snow’s sparkle. A happy mood builds with every new snowflake that piles up. Lots of love and warmth spill out into the streets. chosen to delight family, friends, and loved ones. and a romantic love story is sure to come your way. throughout the snow-covered city streets. All of the items have a “secret heart” hidden inside. forming a snowy crystal floral fragrance available only in our holiday collection. exuding from a snow dome. design come together in a pure, sweet, limited-edition coffret. A snow dome encapsulates a moment of happiness. 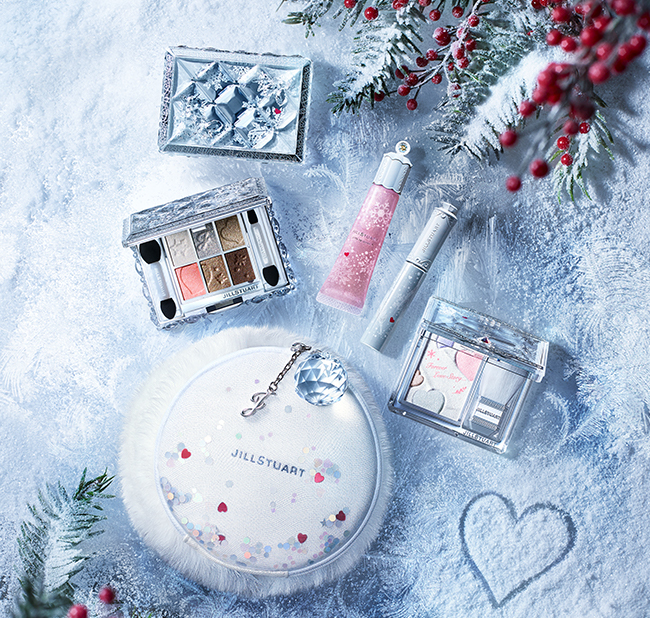 This limited-edition winter pouch will make your heart flutter every time you open it. A delectably snug fit and a sparkle like snow. with colorful lame and rich luster.